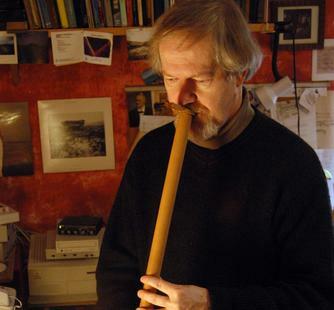 Though currently based in Connecticut, composer Ingram Marshall lived and worked in the San Francisco Bay Area for nearly 12 years between 1973 and 1985. He studied at Columbia University under well-known composer Vladimir Ussachevsky before attending the California Institute of the Arts, where he graduated with his MFA. Marshall’s early work is primarily electronic, but by 1971 he had taken a substantial interest in Indonesian music and began to study the gamelan traditions of Bali and Java. As a result, many of Marshall’s compositions reveal the slowed-down, dreamy sense of time and the melodic repetition that is characteristic of gamelan. In the mid-1970s, Marshall worked to combine his eclectic interests into a unique and memorable sound, sometimes layering electronic tones with the sounds of the Balinese flute, other times incorporating “text sound” in the form of the manipulated human voice. Since 1985, his main focus has been ensemble music that sometimes incorporates electronic sounds and sometimes does not. Marshall’s work has been performed by ensembles and orchestras including the Theater of Voices, Kronos Quartet, Bang on a Can All-Stars, the Los Angeles Philharmonic, and the American Composers Orchestra. He has received grants from the National Endowment of the Arts, the Rockefeller Foundation, the Guggenheim Foundation, and the American Academy of Arts and Letters among others. In addition, the American Composers Orchestra in New York premiered his new concerto for two guitars and orchestra, Dark Florescence, at Carnegie Hall in February 2005. Orphic Memories, commissioned by the Cheswatyr Foundation, premiered at Carnegie Hall in April 2007.